Mind Blown! Jogja Noise Bombing Festival 2016 was maybe the most fun, exciting, crazy, energetic, communal, punk rock nights of live electronic music I have ever experienced. Wow. So many high points! No way I can name them all! It is obvious that the Javanese noise scene came out of punk rock, because this show was as much punk as it was electronic music, a fusion of the two I have never seen anywhere else in the world. Many many thanks to Indra Menus, the organizer, scene maker, and generous soul who is the glue holding Jogja Noise Bombing together. My set ended with a last-second duo with Rully Shabara Herman. Google him. Amazing performer. This will, I hope, be the first of many times I perform with Rully. You turn on the news and it seems that the world is going to hell in a hand basket, but the future of noise music in Jogja is very bright. This entry was posted in Uncategorized, World Tour 2015-2016 on January 23, 2016 by robertostertag. Played a set at the Spectrum, a way underground experimental queer arts and party space in Brooklyn. The kind of space that queer culture desperately needs but is in such short supply. Many many thanks to Gage Boone for making this community possible. Played in the middle of a long bill of crazy queer musicians. Thanks to each and every. Wish my life was like this more often. The high point was the solo vocal set by Raul de Nieves, who is also a visual artist and just about every kind of artist. Powerful and beautiful. This entry was posted in World Tour 2015-2016 and tagged NYC, queer on August 30, 2015 by robertostertag. Yesterday I performed my composition Sooner or Later in El Salvador at the Perquin Summer Festival. 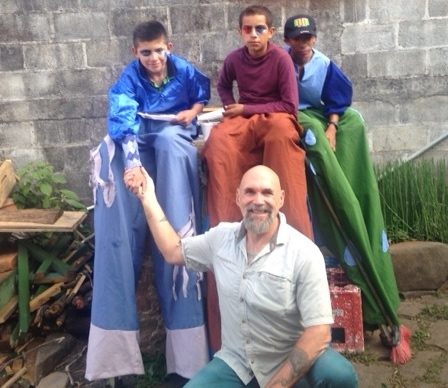 This is the music I made from a recording of a young Salvadoran boy burying his father. Perquin is a tiny mountain town in the most remote part of El Salvador. During the 1980s it was at the center of the largest liberated zone in the country and was known as the “guerrilla capital.” The Summer Festival began in 1992 to celebrate the end of the war, when the area around Perquin was still full of revolutionary fighters waiting to go through the official demobilizing process supervised by UN officials. The festival has run every year since. To give a thorough account of the crazy kaleidoscope that is this festival would require a book. Many former revolutionaries still live in Perquin in little houses they were given after the war. Nearby is a community of several thousand people who fled in refugee camps across the border in Honduras and only returned at the end of the war. These people are still dirt poor, and still deeply affected by the war. This festival was, and is, their festival. But times change, and the festival today also features a professional sound system, heavy metal bands with names like Hazardous Mutation, chartered buses of city kids coming up the newly paved road for a day of smoking weed and listening to their favorite bands play in the countryside, and banners from the far right ARENA party. Despite the fact that the FMLN (the former guerrilla organization) has won the last 3 presidential elections, their last time out they lost the mayor’s office of Perquin for the first time – to the far right ARENA party. People in Perquin are not happy with the FMLN today, both locally and what the national party has become. As former revolutionary and new friend put it, “Welcome to democracy.” There is also a severe drought affecting the entire nation which has turned the subsistence corn fields of the campesinos a sickly brown. Welcome to climate change. It looks like the country will lose 80% of its crops this year. There were campesinos at the festival from a nearby village which no longer has water – people must walk, bus, or drive to get water. 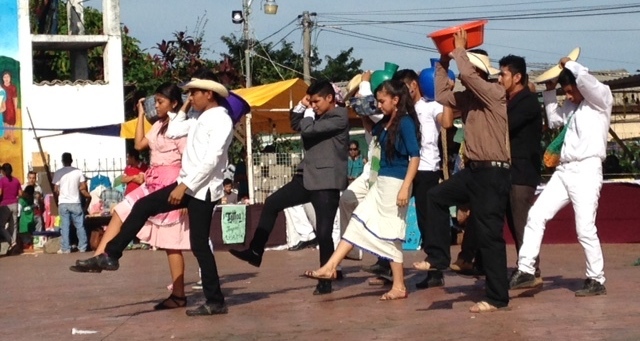 My performance was sandwiched between political street theater from local campesino teenagers about the drought and the privatization of water in the county, and a set by Sangre de Guerra, a rock band formed entirely of children of former guerrilla fighters. OK. That is the nuts and bolts of the matter. To say anything insightful or even slightly intelligent about all of this, or my own feelings about returning here for the first time since the war, will require reflection. A whole lot of reflection. 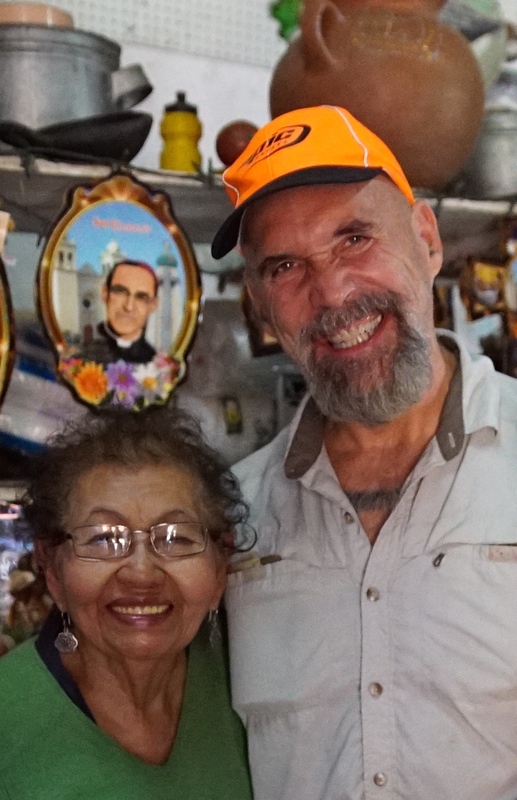 With Alba Gladis Villalobos Amaya, 84, who for years ran a day care center for the children of revolutionary fighters, all of whom called her “Abuela,” or “grandmother.” She now runs a small shop called Abuela’s just off the plaza in Perquin. Campesino street theater before my set. This entry was posted in World Tour 2015-2016 and tagged El Salvador on August 8, 2015 by robertostertag. Leaving Europe. With the exception of a week in Beirut, I have been here four months. So many people to thank. Jon Rose and Gerry Hemingway who I played with in Nickelsdorf, Phil Minton who I played with in Porto – I have known these characters for decades now and their friendship and music has become part of the fabric of my life. Sharif Sehnaoui and Mazen Kerbaj who I just met on this trip and played with in Beirut, and a host of other lesser known but talented musicians in Napoli, Noci, and elsewhere. Then there were my kayak friends, Boyan Zlatarev at the Epic Surfski Center in Tarifa, Kenny Howell of Epic Kayaks who got me a beautiful carbon fiber wing paddle for circumnavigating Sardinia, Guido Cali who introduced me to the surfski community in Cagliari, and Luca Basciu, maker of the Code Zero Surfski, who not only gave me a boat to paddle around Sardinia but kept in touch with me every day, giving me all kinds of useful advice, and introducing me to paddlers all around the island. Of all the amazing things that have happened in the last four months, nothing tops running into Anthony Braxton in the passport line in the Rome airport. Anthony gave me my very first professional gig all the way back in 1978, when he hired me out of school to tour Europe with his Creative Music Orchestra. I was 21 years old and knew pretty much nothing about music or about the world. Like many, many other musicians, my life was deeply touched by working with Anthony Braxton. 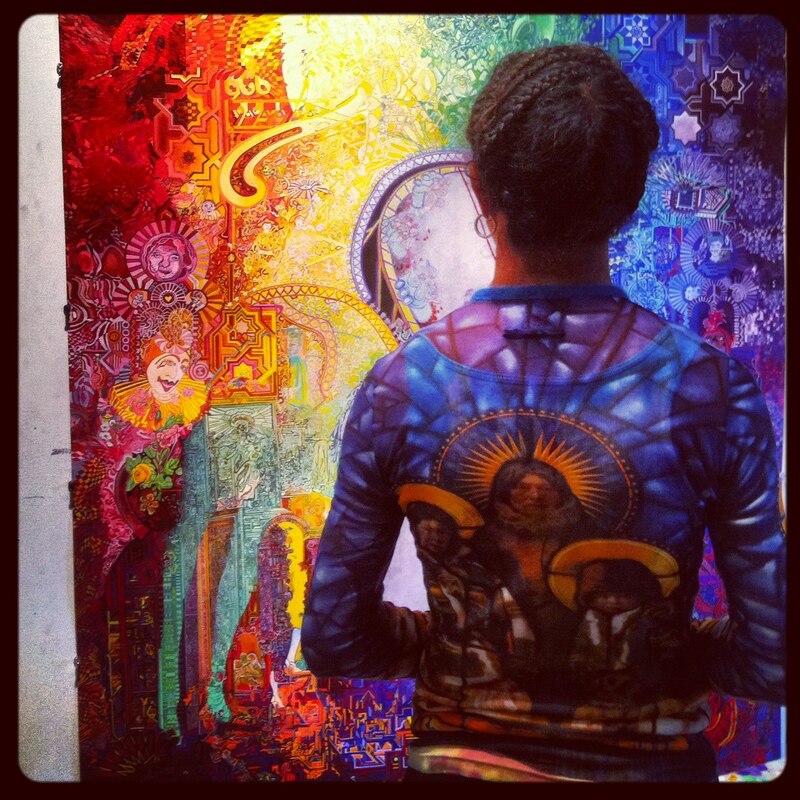 A creative mind, and deep and beautiful person, of the highest order. I was glad to have the opportunity to express at least some of that to him, even if it was after several decades and in an airport line. I have never met anyone like Anthony Braxton, and I am sure I never well. A genuine original. I a so lucky to know him. This entry was posted in World Tour 2015-2016 and tagged Europe on July 29, 2015 by robertostertag.